As a former competitive sailboat racer, being “shipshape” has a very specific meaning: “You only sail with what you absolutely need; then, everything has its place and is to be found in its place when needed). Those that win races don’t carry excess weight, or lose time looking for something. Seconds count. Being shipshape one can focus on what is really important to winning races. Cary and I recently downsized after living 45 years in our previous house. We thought we had decluttered and simplified our lives. We did get rid of a lot of stuff we really did not need when we downsized. Five years later, we realized our new home has also become cluttered because the truth is that our mindset is “stuff expands to fill the space available”. When we ran out of space, we called Angie to have her do an assessment. With her professional expertise and guidance we are now trimming our sails and stowing our gear to be shipshape. There is smooth sailing ahead for us. We like her ideas and most of all, she is a hands on deck crew to help make it happen. Knowing what shipshape means is one thing, making it happen is another. 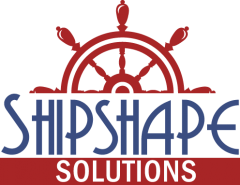 We highly recommend Angie Hyche and Shipshape solutions.